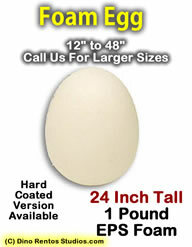 24 Inch Big Egg Foam Prop - Dino Rentos Studios, INC.
24" tall foam egg prop. Great for retail displays or any Easter displays. Made from 1 pound EPS foam. Larger sizes available. Call us.